I'm using Webstorm 6 with Node and have setup the Node core modules. 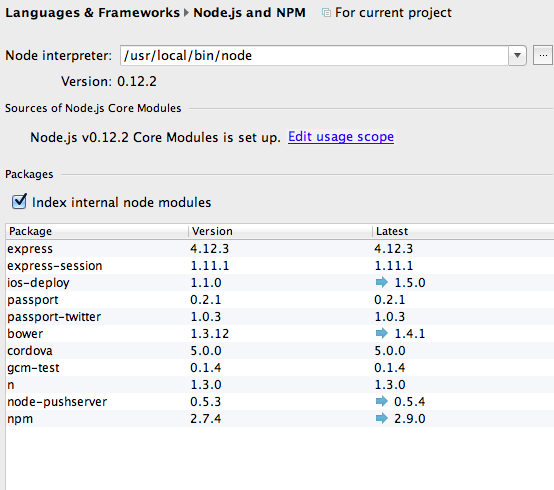 However there is no Node.js globals settings. Is there something I can do? Do you have NodeJS plugin installed and enabled? In addition, I configured it. I don't think it was there before. 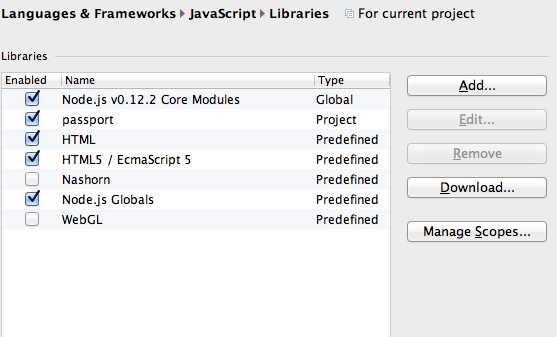 I checked off Node.js Globals, and now require is working. Some of the function called in my libraries and still showing is undefined. Where and how do I add those? Do those "some functions" have a name? Can you post a screenshot with the error/warning message? In any case: I'm not JS/Node guy and will not be here on this one -- somebody else (from JB team) will be able to help you later. In meantime -- you may search this forum and Issue Tracker for this new issue. For those who have this problem in their latest WebStorm/PhpStorm IDE versions (as at Feb 2017), you can go to File/Settings/Languages & Frameworks/Node.js and NPM/ and then under Coding Assistance subsection, find the enable option. @Thilina: Doesn't work. Shows bar then says Disable again. * disable "Coding assistance for Node.Js"
I had the same problem after updating to 2018.3, and I confirm that Brian Mcclure's method above fixed the problem.